With the latest release for VMware NSX-T Data Center 2.4, we announced the support for IPv6. Since the advent of IPv4 address space exhaustion, IPv6 adoption has continued to increase around the world. A quick look at the Google IPv6 adoption statistics proves the fact that IPv6 adoption is ramping up. With the advances in IoT space and explosion in number of endpoints (mobile devices), this adoption will continue to grow. IPv6 increases the number of network address bits from its predecessor IPv4 from 32 to 128 bits, providing more than enough globally unique IP addresses for global end-to-end reachability. Several government agencies mandate use of IPv6. In addition to that, IPv6 also provides operational simplification. NSX-T Data Center 2.4 release introduces the dual stack support for the interfaces on a logical router (now referred as Gateway). You can now leverage all the goodness of distributed routing or distributed firewall in a single tier topology or multi-tiered topology. If you are wondering what dual stack is; it is the capability of a device that can simultaneously originate and understand both IPv4 and IPv6 packets. In this blog, I will discuss the IPv6 features that are made generally available with NSX-T 2.4 Data Center. Let’s start by understanding IPv6 addressing in NSX-T Datacenter world and what kind of IPv6 addresses are supported. NSX-T Datacenter supports following unicast IPv6 addresses. Unique local: Site specific unique IPv6 addresses used for inter-site communication but not routable on internet. Based on RFC4193. The following table shows a summarized view of IPv6 unicast and multicast address types on NSX-T Datacenter components. NSX-T Data Center 2.4 release introduces dual stack support for the interfaces on a logical router/gateway in both single tier topology and multi-tiered topology. The diagram on the left shows a single tiered routing topology with a Tier-0 Gateway supporting dual stack on all interfaces. 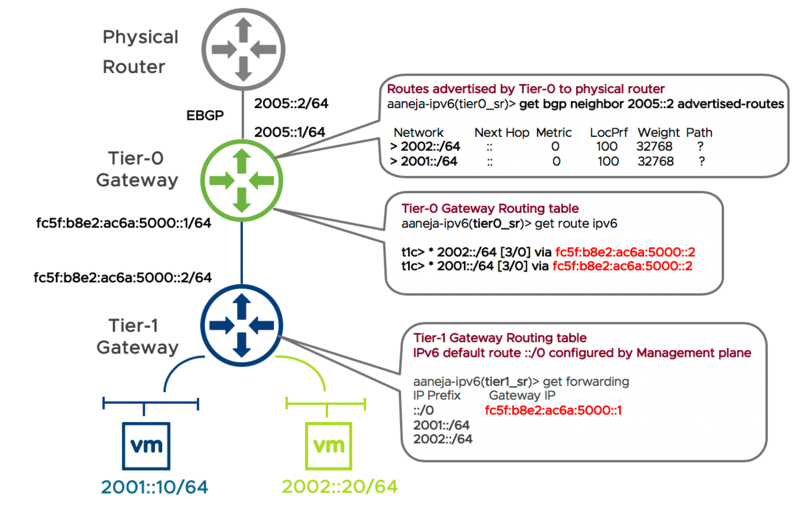 The diagram on the right shows a multi-tiered routing topology with a Tier-0 Gateway and Tier-1 Gateway supporting dual stack on all interfaces. You can either assign static IPv6 addresses to the workloads or use a DHCPv6 relay supported on gateway interfaces to get dynamic IPv6 addresses from an external DHCPv6 server. In my previous blog, I explained how connectivity is provided between Tier-1 and Tier-0 Gateway in a multi-tiered topology. Each tier-0-to-tier-1 peer connection is provided a /31 subnet within the 100.64.0.0/10 reserved address space (RFC6598). Similarly, for IPv6, each tier-0-to-tier-1 peer connection is provided a /64 unique local IPv6 address from a pool i.e. fc5f:b8e2:ac6a::/48. A user has the flexibility to change this subnet range and use another subnet if desired. A global flag is provided to enable/disable IPv6 forwarding. It is disabled by default because of security reasons and to ensure that an upgrade from 2.3 to 2.4 release doesn’t enable link-local IPv6 address on all interfaces. The following screenshot shows how to enable IPv6 forwarding. Let’s start with E-W routing. In my previous blog, I have discussed how NSX-T Data Center can provide optimal distributed routing for E-W traffic. If your workloads are on the same hypervisor but in different subnets, traffic doesn’t have to leave the hypervisor to get routed. This is also applicable for IPv6 workloads now, whether it’s a single tiered topology or multi-tiered topology. Let’s validate E-W distributed routing by running traceflow between two IPv6 workloads 2001::10/64 and 2002::20/64. Both workloads are logically connected to a Tier-1 Gateway and hosted on the same hypervisor. Notice that the packet doesn’t leave the hypervisor to get routed. Moving on, let’s look at the IPv6 routing feature set that we have introduced in this release. Outbound and Inbound route influencing using Weight, Local Pref, AS Path prepend and MED. When a Tier-1 Gateway is connected to Tier-0 Gateway, management plane configures a default route (::/0) on Tier-1 Gateway with next hop IPv6 address as Router link IP of Tier-0 Gateway (fc5f:b8e2:ac6a:5000::1/64, in the following topology). To provide reachability to subnets connected to the Tier-1 Gateway, the Management Plane (MP) configures routes on the Tier-0 Gateway for all the LIFs connected to Tier-1 Gateway with a next hop IPv6 address as Tier-1 Gateway Router link IP (fc5f:b8e2:ac6a:5000::2/64, in the following topology). 2001::/64 & 2002:/64 are seen as “Tier-1 Connected” routes on Tier-0. Tier-0 Gateway can now redistribute and advertise these routes in BGP peering towards physical router. Nearly all organizations that use NSX, leverage Micro-segmentation. Users can now enforce L2-L4 stateful distributed firewall (DFW) for IPv6 VM workloads. These firewall rules can use IPv6 addresses, IPv6 CIDR, IP Sets that include both IPv4 and IPv6 addresses and NSGroups that can include logical ports that have both IPv4 and IPv6 addresses. Along with distributed firewall (DFW), we also support Edge firewall for IPv6 VM workloads connected to both Tier-0 and Tier-1 Gateways. This Edge firewall is a perimeter firewall that provides inter-tenant/inter-zone firewalling capability and can be used for developing PCI zones. Along with DFW and Edge firewall features for IPv6, we also support DHCPv6 guard and RA guard. DHCPv6 server block feature prevents unauthorized or rogue DHCPv6 servers to send DHCP reply to a VM, this is done by filtering UDP Source port 547. DHCPv6 client block feature prevents a VM from sending out DHCPv6 messages which are typically sent out by a DHCPv6 client, this is done by filtering UDP Source port 546. RA Guard feature prevents against rogue RA (Router Advertisement) generated by unauthorized routers/devices on the network. VMware NSX-T Data Center 2.4 introduces IPv6 support along with a plethora of networking and security features. This release introduces distributed routing support for E-W IPv6 and centralized routing support for N-S IPv6 traffic with static routing or BGP with all the inbound and outbound route influencing knobs. Users can now leverage NSX-T’s unique distributed firewall (DFW) functionality or Edge firewall functionality for IPv6 VM workloads available on both Tier-0 and Tier-1 Gateway. Here are some resources to explore NSX-T Data Center. The post Introducing IPv6 in NSX-T Data Center 2.4 appeared first on Network Virtualization.